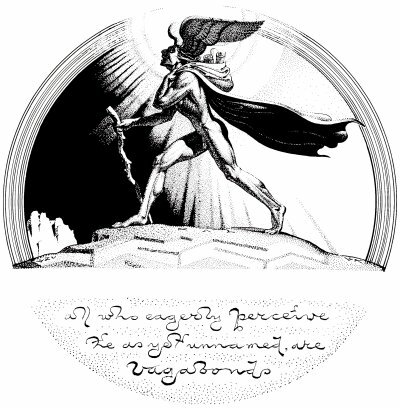 Eight illustrations by Stanislav Szukalski from Behold!!! The Protong — a sampling of his 39 volume oeuvre on the science of Zermatism. Szukalski was a polymath who, over a lifetime, developed a science that integrated singular theories in geology (cyclic deluges), anthropology (universal pictographs), linguistics (Protong, a universal first language), zoology (Yeti), anthropolitics (Yetinsyn), with many etceteras. Common to his arguments is an overwhelming accretion of the visual evidence. “Looking through thousands of illustrated books, I have learned how to SEE. Since childhood I have been addicted to seeing ‘pictures’ in books… I learned not only to look, but really SEE, for I did not know English yet and had to jump to CONCLUSIONS. In fact, I evolved the, to other people unnatural, instinct for UNDERSTANDING things, without knowing what they were. Looking became my life’s OBSESSION. When I am dying I will despair over the fact that I will no more be able to Look and See” (p14). “When the Secondary Globe (the lavaic ocean bottoms) began to submerge in the beginning of the last Farsolar Epoch, the global seas were forced to glide off the Primary (Geologic) Globe. The soil of all the lands that were re-emerging was washed off by the departing seas and the water of the globe became very muddy. In fact, Plato, after visiting Egyptian temples, learned of the chronicles that spoke of the Mediterranan Sea as ‘The Sea of Mud’. Homer’s Iliad was about Ilium (the Latin word for ancient Troy) which in Protong means ‘Mire Remembered’. The state of Illinois, U.S.A. is named after the Illinois River, and in Protong (‘Illi No J(e) Z’) actually means ‘Mire made-Born is From’. “Wherever the terrified diluvial escapees shored re-emerging lands, their faces were caked with mud. And since each swam differently, each would emerge with individual muddy water ripples across the face. So when they lay there in the mud in the deadly faint, exhausted beyond words, and were found by earlier arrivees on that islet, the facial mud markings were remembered and the Flood Scumlines became the tribal markings. I have an entire volume on these Scumlines with 195 such drawings from every part of the globe” (p31). 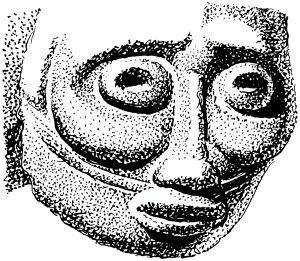 A head from Rapa Nui (Easter Island). 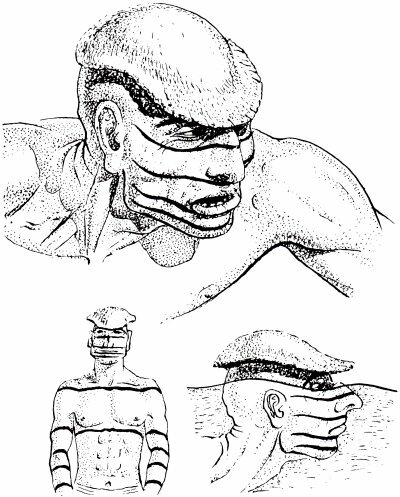 “The horizontal line [the Flood Scumline] below the nose clearly shows that the ancestor swam to that island in the last Nearsolar Deluge” (p19). “In Equador and the vicinity of the Panama Canal there are Indians who paint their bodies with black lines emulating the waters in which they stood. They repeat the same lines on their faces, but the topmost of these crosses their noses, just below the eyes. This means that their diluvial ancestor buried his face under the water while swimming and made a stronger stroke with his arms when he came up to get air” (p25). 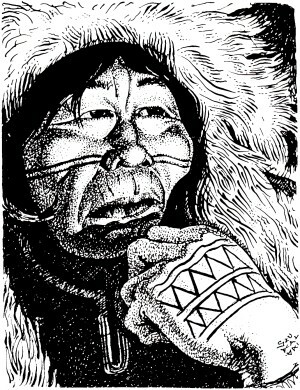 “This Eskimo’s diluvial ancestor swam with the nostrils under water, coming up to inhale while starting his arm strokes” (p20). “One of the many funerary jars for holding the ashes of the cremated dead. This one is from prehistoric Poland… Atop the head reposes the cover in the shape of Easter Island. On their necks are many metal necklaces and, as in this one, the image vomits the salt water of the sea. These rings on the neck emulate the water ripples spreading from a drowning person. Usually, there is a large ‘spzilla’ (Polish for ‘pin’) as a Rebus for ‘Z Bi La’ [Protong], which tells us that the person cremated came ‘From Killed (by) Flood’ land and to there was returning” (p22). 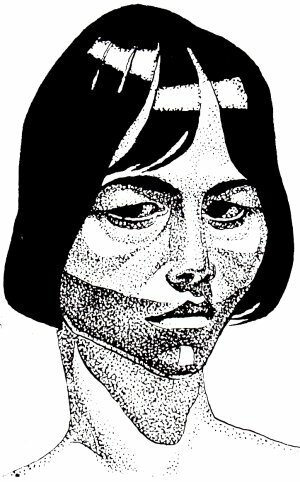 “The Chiaco Indian tribe of Equador continue to mark their faces with the Flood Scumline on the very rim of their upper lip” (p20). “A funerary portrait of a young man drawn from the lid of a large jar that holds the ashes of a cremated man. It was excavated in Italy and dates from the Etruscan period. 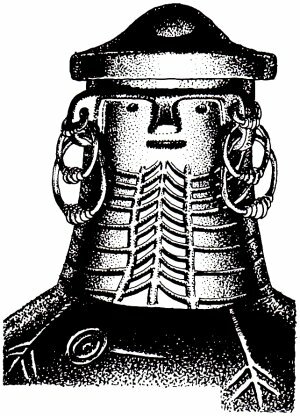 On the man’s face the ancient tribal Flood Scumline was engraved, crossing his mask just below his nose, emulating a beard. However, the vertical direction of continuous lines tells us that this is really the draining water, heavy with mud. 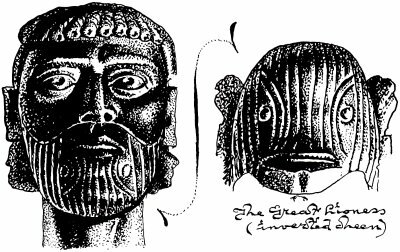 “The two small circles on the chin and the edge of ripples around them made me turn the drawing upside down and there I saw that the mask resembled the Great Lioness (Easter Island), streaked with sliding-off water as if re-emerging from under the Flood” (p26). 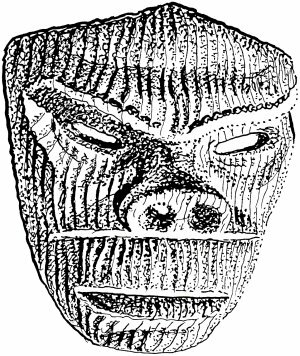 “Among ancient carvings of the Dorset Culture of the Point Barrow region in Alaska, this mask was discovered which white men assume is an imaginary Devil. But you can plainly see that it is a portrait of a local Sasquatch. Incidentally, in the vertical lines we have a marvelous document. They were carved there to let us know that this creature, like the ancestors of the Alaskan Eskimos, also saved himself from the Deluge, for any lines, vertical or horizontal, represent ‘waters’, hence the Great Flood. There is still another pictograph, besides the vertical draining-off of muddy water. It is the horizontal line just below the nostrils which, by being placed above the water level, tell us that his breath, his SOUL, was saved” (p77). “Those that saved themselves from drowning, noticed that these creatures also had the fortune to survive, so they named them accordingly, everywhere on this globe in one language, my Protong. The present name Sasquatch was then ‘Sa Z Gladz’, which means ‘Here From Destroyed’ (i.e. the deluged continent)” (p75-6). All who eagerly perceive the as yet unnamed are vagabonds. Great post. I really enjoyed it. I will have to bookmark this site for later. Interesting imagination, wonderful artist, lousy scientist. so many pieces scattered trough the unconscious collective.